Feature and Interview in Graffica International Magazine. Portrait by Mark Salmon Photography. Feature on Golden Globes 2019 in National Spanish newspaper. "The book acts as an inspiring introduction to the world of hand-lettering. Shunning uniformity, 42 international artists with the most sought-after works contributed to create a guide to the aged technique accompanying our contemporary culture..."
Work featured in the 'Expressive Type' book. Book description from Amazon - "Expressive Type showcases the work of major international designers working with typography in branding and advertising, environment, packaging and products, and self-initiated projects"
Feature in Faber Castell worldwide magazine. 'Meet the man behind the marker'. Interview and feature on the collaboration between myself and Halfords / Voodoo bikes on a range of BMX bikes sold throughout the UK. Click here for the full interview. Page feature in IdN magazine. IdN is an international publication for creative people and its mission is to amplify and unify the design community. Part of the media pack distributed worldwide for the launch of the 'Do the green thing' project with WWF. A feature in the US based publication UC.Quarterly. UC.Quarterly is a summary of the most interesting, relevant, and simply fun-to-see creative global projects. A feature on my hand lettered disposable coffee cups in The Daily Mail. The publication has an average daily circulation of 1,700,000 copies and has over 100 million unique visitors per month to its website. A feature on my discarded coffee cups from the homepage of Design Taxi. 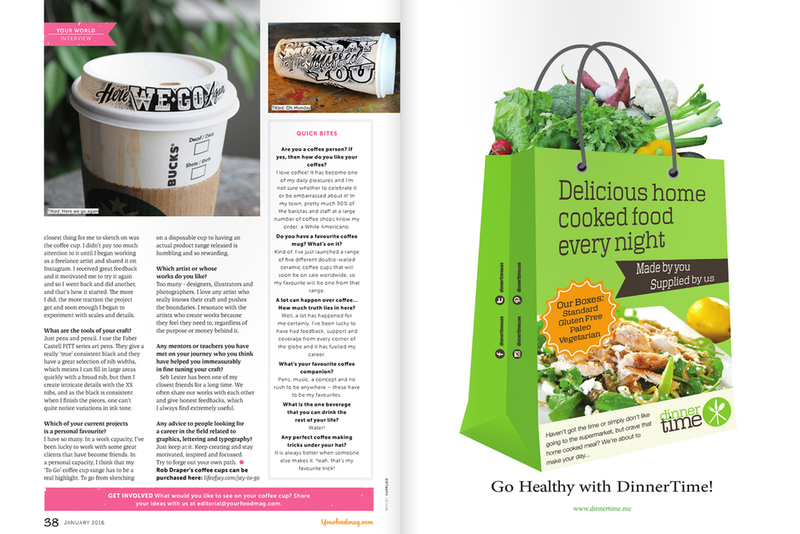 Feature and Interview in Your Food Magazine, Dubai. 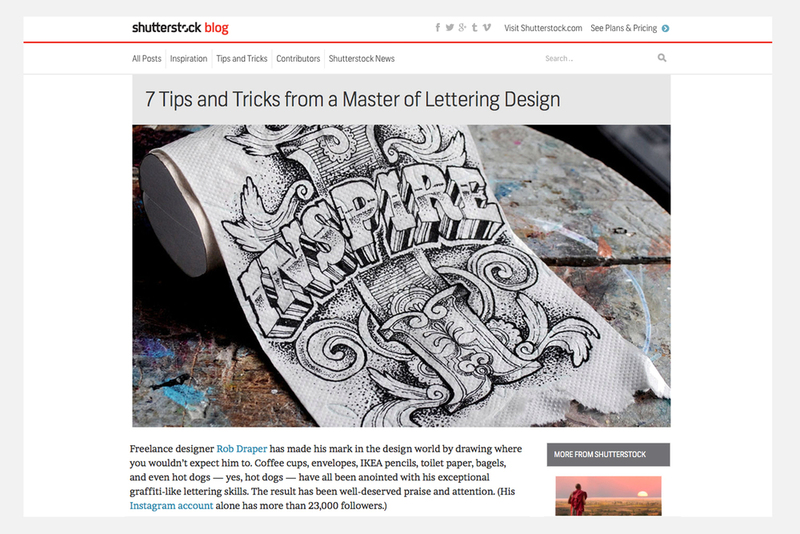 Work featured to represent 'Design' on the worldwide homepage of Pinterest. Press release for the launch of the 'Do the green thing' project with WWF. Feature and interview on the Good Type website.